Rediff.com » Sports » What brought this Swiss racer's F1 hopes to grinding halt? What brought this Swiss racer's F1 hopes to grinding halt? 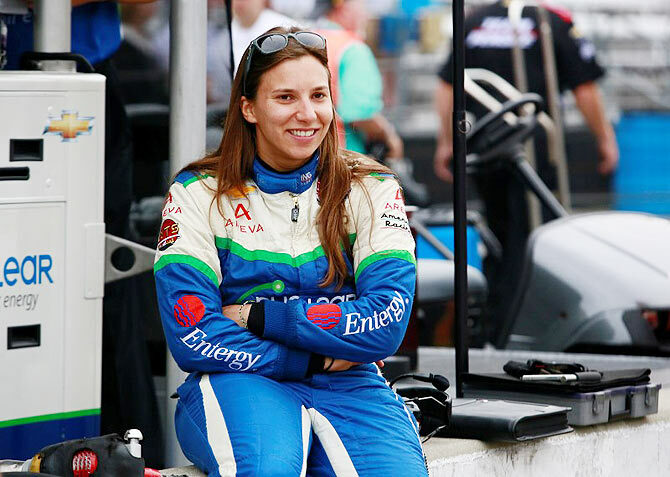 Swiss racer Simona De Silvestro's hopes of becoming the first woman since 1976 to race in Formula One have suffered a setback with the Sauber team ending a testing deal due to her lack of funds. The 26-year-old had been expected to take part in first practice at next month's US Grand Prix in Austin and had set her sights on a race seat for 2015. Sauber had said in February, when it was announced that she was joining as an "affiliated driver", that they intended to support her ambitions. However a team spokesman said on Wednesday De Silvestro's driving programme had been stopped "due to financial reasons on her side". "Everybody in the team who worked with her during the last six months is very disappointed it came to this point, because they liked working with her," he added of the contractual problems. Swiss-based Sauber, once a solid midfield team who have yet to score a point in what has become their worst Formula One season, have financial troubles of their own and need their drivers to bring funding with them. De Silvestro had her first taste of Formula One in April when she had a test in a two-year-old Sauber at Ferrari's Fiorano track. She subsequently tested also at the Valencia circuit in Spain. The Swiss previously spent four years competing in the U.S. IndyCar series and was 2010 Indianapolis 500 rookie of the year. The first woman to finish on the podium at an IndyCar street race, with second place in Houston in 2013, she joined Sauber in February and was considered the woman racer most likely to join the men on the starting grid in the near future. Britain's Susie Wolff has taken part in free practice sessions with Williams this year. Meet Formula One's baby, Max Verstappen!